Our Baccarat Discard Cans measure 7-1/4 inches high, with an outside diameter of 6-7/8 inches, and an inside diameter of 6 inches. 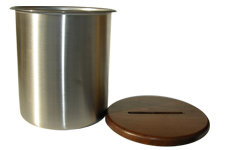 The Baccarat Discard Cans are made of silver stainless steel. Each can's lid is made of handsome walnut-colored hard wood and features a slot for discarding playing cards. Our 20 Hole In-Line Baccarat Marker Rack features all wood construction. The Rack has 20 tubes to hold 200 lammers/markers. Each Baccarat Marker Rack measures 33.25 inches long by 1.5 inches high by 1.5 inches deep. For additional information on our Baccarat Discard Cans and Marker Racks, please contact us toll-free at 1-800-233-0828. You might also be interested in our complete selection of Baccarat Supplies, including Baccarat Tables, Baccarat Layouts, Baccarat Dealing Shoes, and Blank and Custom Imprinted Double Ended Baccarat Pens and Pencils.